Battle Valor Gaming is dedicated to providing unique Games, Rules and Miniatures untilizing our vast Tabletop Gaming Experience and our decades long involvement in every aspect of this fantastic Hobby. We firmly believe our customers are the most valuable part of our business, and will endeavor to provide you with the highest level of Customer Service and Involvement possible. Join our Facebook Group for all the latest news and Updates, and Discussions. Search Battle Valor Games in Groups. 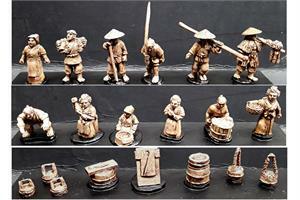 The Miniature range is scaled around the Human races which are 18mm tall. 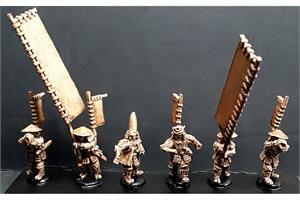 Some races are taller like the Orcians and Scalians which are 20mm. 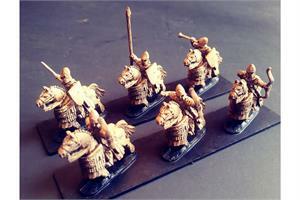 Some races are shorter like the Dwarians and Goblians which are 13mm. If you are going to pay by Paypal on the website, it is important you follow the checkout procedure to the end so you can select your shipping. This is very important for International customers. Do not checkout directly from the cart with paypal, you will not get the best shipping option available to you. We have a European Distributor based in the UK! I am delighted to announce that I now have a European Distributor based in the UK. This is Martin Mitchell at Dragonfrog Games. Martin is stocking the entire line, and has been a supporter of Battle Valor Fantasy from day one.We are currently in the process of casting hundreds of Miniatures for him. Here is a link to his website, please feel free to contact him via the site. is now live for 24 days. It ends on Sunday April 28th, at 10.14pm EST. As always, during the Pledge Manager Phase you will have access to the entire range of BVF figures as well as all the new packs, at the Kickstarter prices. I have taken on board as much as your feedback as I could for this one. It features Amazonians (Angry Women) and Wyrmians (Dragonmen) as the 2 immediately available new armys, with the Falconians (Birdmen) and Rhinocians (um, Rhinomen) as Unlocks. There are also 46 expansion packs for the Pyramians, Vampirians, Scalians,Vermians and Hellians available. 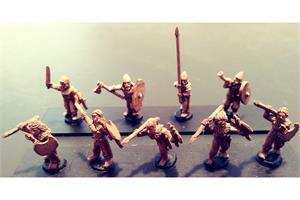 The GODS Army is on offer again as it is a Kickstarter and Show exclusive army. This is one of a few chances you will have to get it! There are Egytptian themed Creatures in both the expanding Pyramian range and the Gods Army (Annubis types for instance). 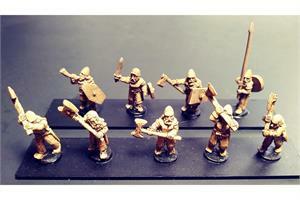 There are cool unlockable items like a Baggage Camp set, Pikemen units, and more. "Meeting at the Gnarled Oak"
This is the FREE Adventurers/Baggage Camp all backers will receive if it unlocks! Any pledge is helpful, particularly since I am striking out on my own! Your support as always, is very much appreciated. 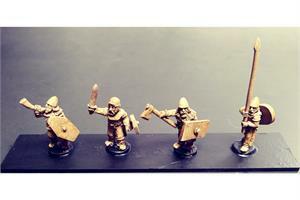 3/17 This weeks New Releases for the BVF Range are the Barbarian Double Handed Axemen and the Barbarian Spearmen with Shields. These are available in Full, Half and Skirmish Packs. and for the Japanese Range, Ninjas with Various Weapons, Usagi Rabbit Spirits, and Dead & Dying Villagers. 2/24 This weeks New Releases for the BVF Range are the Barbarian Command, Barbarian Swordsmen with Shields, and Barbarian Javeliners. These are available in Full, Half and Skirmish Packs. 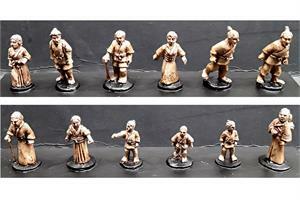 and for the Japanese Range, Ronin, Villagers, and Working Villagers. 2/11 An exciting week this week. First off, this weeks New Releases for the BVF Range are the Elvian Cavalry with Bows on Lightly Armored Horses and the Decian Cavalry with Bows. These are available in Full, Half and Skirmish Packs. This week also see's the start of the Release of Philip "Chip" Manns's range of Japanese Historical and Mythological figures. 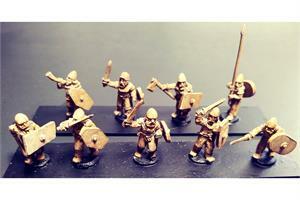 There will be well over 300 miniatures in the range, and it is available exclusively from Battle Valor Games. Most packs contain 6 figures. 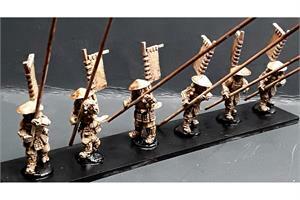 The first 5 packs to be released are the Samurai Command, Mounted Samurai, Samurai, Ashigaru with Yari Advancing, and Ashigaru with Teppo/Yumi. These are beautifully sculpted, and you can expect to see weekly releases. 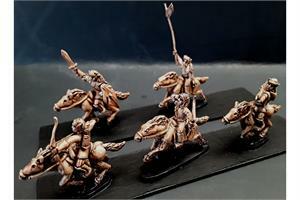 2/4 This weeks new releases are the Wovian Cavalry with Bows on Stags and Horses. 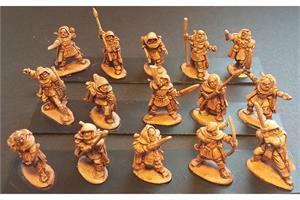 These are available in Full, Half and Skirmish Packs. Starter Armies are now Available for 11 of the 13 Current Races. 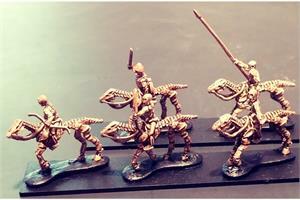 Each Army contains 68-73 figures, and costs just $70. 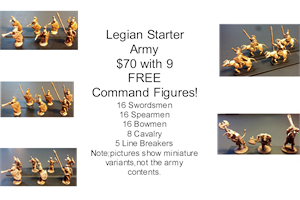 In addition, each Army comes with 9 FREE Command figures. Well its taken me a while to get them set up, but you will be happy to know that Skirmish Packs are now available for all existing Infantry, Cavalry, Linebreakers, and Animals Packs. 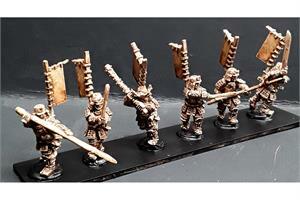 You will find these items on the appropriate Army Page, near the top, or on the Skirmish Packs Category Page. There is a drop down menu that allows you to select the pack type you want. I am delighted to announce that the new official home of Battle Valor Games is the The Games Tavern in Chantilly VA. The store address is 4124 Walney Rd, Suite H, Chantilly,Virginia, 20151. Within a couple of weeks, you will be able to come to the store and buy the entire BVF product range right off of the shelves. It is a fantastic new store, with loads of games tables, and all the usual product you would like to find at your local game shop. This site is also where I will be manufacturing the range, and is also home to Covert Intervention Games. I will be running BVF game demos, gaming events, and more most Saturday afternoons, and ultimately the first trial tournaments. Stop by and see this great new Game Store! I am now happy to announce that I am ready to start selling the Battle Valor Fantasy range into Hobby Stores. 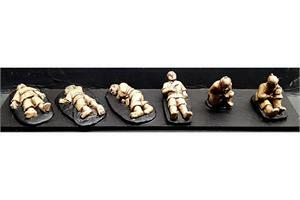 If you would like to carry the range please shoot me an email at ed@battlevalorgames.com. I will send you all the necessary information to open an account. International Shipping is based on the weight of your order, and you will be presented with options during the checkout process. All orders up to $74.99 are shipped with a flat rate of $7.50 by Priority Mail. All orders over $75 are freight FREE. If you plan to pay using Paypal, please go through the entire checkout process. This will give you the ability to select your shipping based on the weight of your order. If you try to checkout directly from your cart using the Paypal Button, it will automatically assign shipping to your order, and it might not be the best rate. 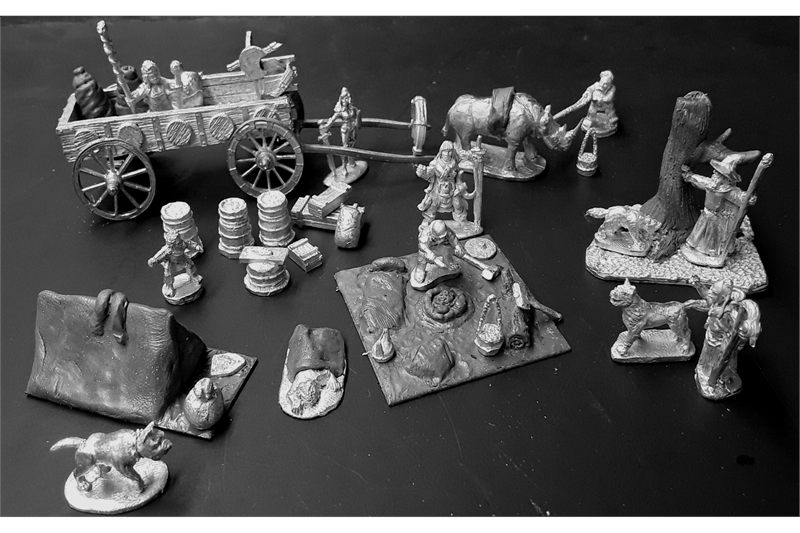 As you can see to the left, we have a vast range of miniatures under development. As each range starts to come on line, I will remove the Coming Soon!. 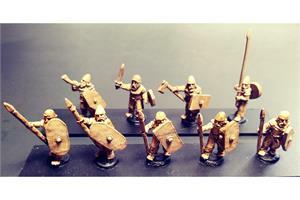 It is my intention to update the website as often as possible with new miniatures. As I receive the greens, they will be master molded, and I will post pictures of them, so you can always see whats just on the Horizon. You can expect new releases to be available pretty much every week for the forseeable future. The miniature pictures do not show the full contents of the packs. They show the variation of figures and accessories that the packs are made up from. Read the item descriptions to see what you get. If you want to start building an army for BVF, below are basing guidelines. Note that the game uses both square and round bases. This represents facing in the game. Units on round bases, can move, charge, shoot etc in any direction. They have no facing. Units on square bases, can only see to their front. Minimum unit size for all Infantry, Missile Troops, Animal Packs and Cavalry Units in BVF is 4 Stands. There is currently no maximum size, although this may change. 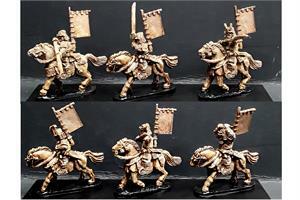 General- Your general should be mounted on a 40mm Diameter Bases. 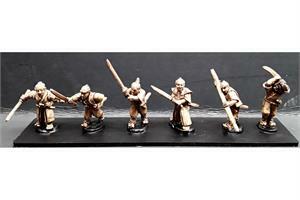 Characters- Your character models should be mounted on 25mm Diameter Bases. 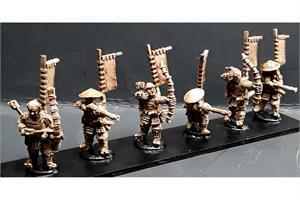 Infantry- Your Infantry should be mounted 4 miniatures to a base on 40mm x 40mm bases. 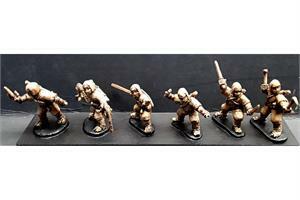 Missile Troops – Your Missile Troops should be mounted 2 to a base on 40mm x 20mm Bases. 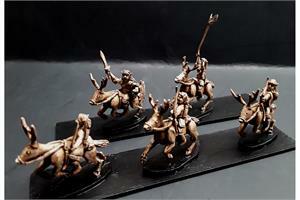 Cavalry – Your Cavalry should be mounted 2 figures to a base on 40mm x 40mm Bases. Line Breakers - Your Ogres, Trolls, Stone Golems, and similar sized creatures should be mounted individually on 25mm Diamater Bases. Shock Troops - Your Orcian Moorbeasts, Iron Golems, Giants and similar sized creatures should be mounte individually on 40mm x 40mm Bases. 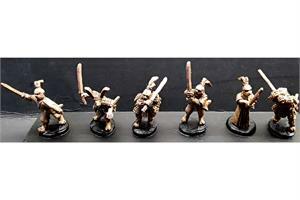 Animal Packs - Your War Hounds, Wolves, War Boars and similar units should be mounted 3 to a base on 40mm x 40mm Bases. Fliers- Your fliers should be mounted individually on 40mm Diameter Bases. Monstrous Creatures - Your War Mammoths, Tricericades, Juggernauts and similar sized creatures should be mounted on 40mm x 60mm Bases. War Machines – Your War Machines should be mounted on a 100mm x 50mm Bases. "War is coming? I think not. War has been here, is here, and will continue to be here until such a time that the Gods see fit to rid the World of the Pestilence of so called Intelligent beings. It is within our very nature to covet, desire, and try to obtain those things that belong to our neighbors, be they man or beast. Thus, conflict is inevitable." Attributed to William of the Legian, Wise beyond his years. The World of Legian is populated by countless races, with many names that I myself would not attempt to pronounce. For simplicity's sake, we will refer to all races by the names given to them by men. Legian has been forever at War, and for a very good reason, if one is even necessary. This deserves explanation if only to prepare you for the World you have entered. When the Gods created our World and its Denizens, they also ensured its, and their destruction. Afterall, why come back and clean up your mess if you can get someone else to do it. As they left this realm, they promised two things. One, that they would return at a time suited only to themselves. Two, that the race that had proved itself most worthy by the number of souls claimed throughout the ages would ascend to the Heavens and live in Paradise among the Gods themselves. They left the 12 Great Abaci to keep track of the score as the bodies began to pile up. Their last act was to create the Legian itself. This very skilled military force was given a mission. To make sure no one race ever got too far ahead or became too dominant. To this end, the Legian has always found a reason to declare War on the strongest, using politics and espionage to hide the real reason. The ranks of the Legian believe their mission is to defend the weak. Only the 3 High Marshalls know the truth. That the members of the Legian, and only them, will ascend to live among the Gods.